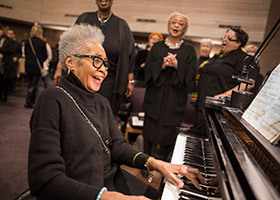 BEDFORD — Loving people of all races and prayers for a genuine conversion of the heart, one soul at a time, was prominent in the message shared Jan. 12 at St. Michael Parish in Bedford during the 33rd Annual Dr. Martin Luther King, Jr. Memorial Mass. 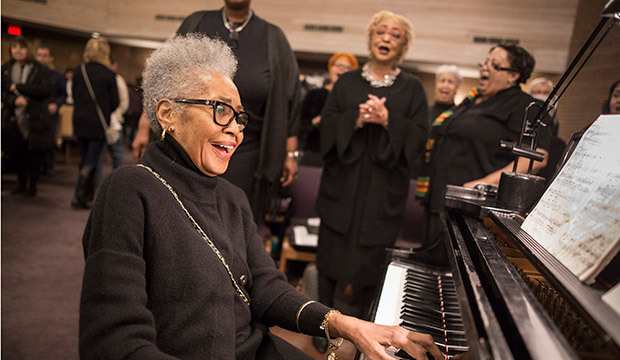 Amid a sanctuary adorned with vivid decor, the choir swayed and clapped to the music — some songs soulful, some jazzy — as the saxophone, trumpet, and drums accompanied the piano during the celebration, which was a beautiful blend of African heritage and Catholic tradition. One highlight of the evening was a special performance by the Saint Bakhita Choir of St. Joseph Parish in Arlington, as they sang the offertory song in Kikongo, a language from the Democratic Republic of the Congo in central Africa. Bishop Michael Olson, as he introduced guest homilist Stephen Berg, Bishop of the Diocese of Pueblo, Colo., said the evening is a both a celebration and a time to remember what God has called us to do. 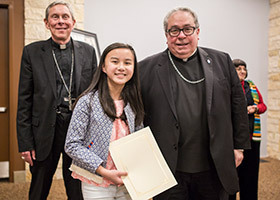 “We come together as God’s people, conscious and aware that there are many times when we fail to love God and to love our neighbor,” Bishop Olson said. After a Gospel reading from Luke about Jesus’ Baptism, Bishop Berg began the homily with a reminder of this prominent point in earth’s history. “The passion and joy with which he delivered this speech can only be remembered now with a certain sadness that we, our country, have not lived up to that dream,” Bishop Berg said. 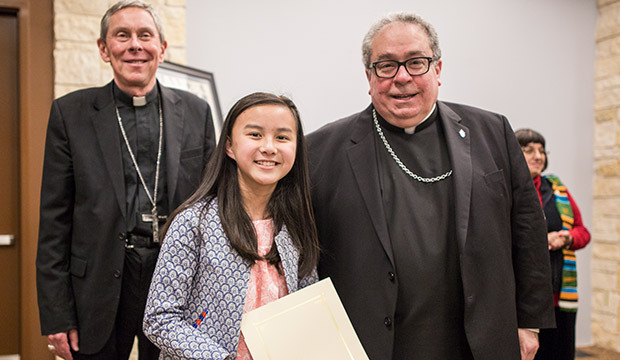 Bishop Berg said what we need now is a genuine conversion of heart, a conversion that will bring change and reform to our institutions and society. Bishop Berg also spoke about free will, which is a gift from God given to all people no matter what ethnicity or race. Bishop Olson said the sin of racism both in social form and individual form offends God and undermines His truth. 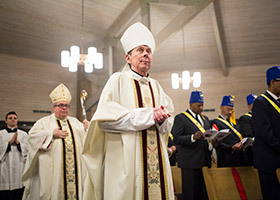 “It is the goal of the devil to separate us and disperse us,” Bishop Olson said. “It is the vocation of Christ that we love in the communion with God and each other. The annual Dr. Martin Luther King, Jr. Memorial Mass dates back to 1986 when Father Carmen Mele, OP, who at the time served as the director of the diocesan peace and justice ministry, wanted to honor the civil rights leader and reach out to African-American Catholics. Since then, a committee has organized the annual Mass which rotates among churches in the diocese. 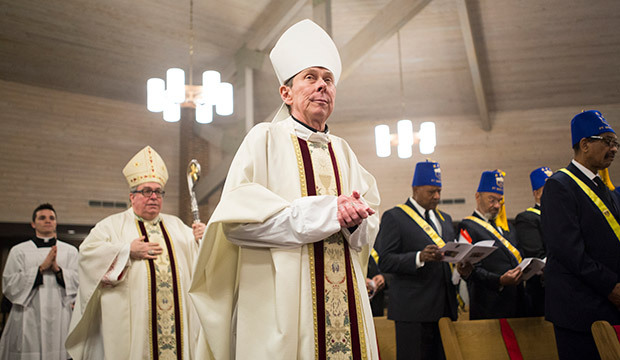 Bishop Berg was ordained a priest in 1999 for the Diocese of Fort Worth, where he served at various parishes, including St. Michael, St. John the Apostle, and St. Peter the Apostle. He served as administrator for the diocese from Dec. 2012 until Feb. 2014, when he was ordained and installed as the bishop of the Diocese of Pueblo.